Adrianna does a lot for her elderly mother who suffered a stroke last year. She makes sure her mom is comfortable, safe, clean, and fed. However, like many family caregivers, Adrianna is so focused on fulfilling her aging mom’s daily needs that she often doesn’t have time for herself or her own interests. Adrianna’s New Year’s resolution is to somehow find more time to exercise but doesn’t know how she will do that with her elderly mother’s constant need for care and companionship. The good news is that there are several ways that Adrianna can fit in some exercise, so she can keep her New Year’s goal and care for her mother at the same time. Finding the time for yourself can be very difficult if you are a family caregiver with a responsibility to your elderly relative. However, it isn’t impossible to do with some creativity, determination, and perhaps some help from a senior care provider. You can work out while at home with your loved one in the other room when you use home equipment or an exercise DVD. If you hire a senior care provider, you can leave your aging loved one in good hands as you head to the gym or outdoors to jog or bike. No matter what kind of exercise you choose or how you find the time, it’s important to make it a priority for your own health and wellness. Here are some reminders of why family caregivers like you must do all you can to make exercise a top priority in the new year. It’s hard work being a family caregiver, and with all the lifting, pulling, and reaching you must do to take care of your aging loved one, you need all the strength and stamina you can get. When you exercise, you pull in more oxygen to the body, reducing fatigue and energizing every cell. 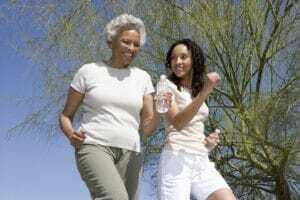 You’ll be a better caregiver when you feel the benefits of regular exercise in your muscles. Studies show that regular exercise does wonders for the body’s immune system. When your immune system is strong, you have a better chance of resisting certain illnesses like influenza or pneumonia. You’ll also do some good long-term by helping your body reduce the risk of serious diseases like heart disease, kidney disease, and more. Being overweight or obese leads to a number of negative health issues. Maintaining a healthy weight is essential in keeping control over your body and helping it to function properly. Your bones, joints, and organs will all work better when you’ve lost some fat and you’ll also bring down your blood pressure. More than anything, you’ll also feel better about how you look as exercise can affect your metabolism in a positive way. Interestingly, regular exercise is tied to better digestion, so if you are having trouble in the tummy area, consider hitting the gym when the senior care provider comes. Many people report that they do better with digestive issues when they attend a vigorous event. Exercise can also lead to a good night’s sleep, with restorative and restful sleep essential to health and wellness. The staff at Home Care Matters is available to talk with you and your family about all of your needs. Home Care Matters is a home care agency providing quality and affordable senior care in Duluth, GA and the surrounding areas. Call (678) 828-2195 for more information.